If you want the perfect, homely-yet-luxurious place to stay near Universal Studios in Orlando, then Ramada Plaza Resort & Suites by Wyndham Orlando Intl Drive is a good choice. 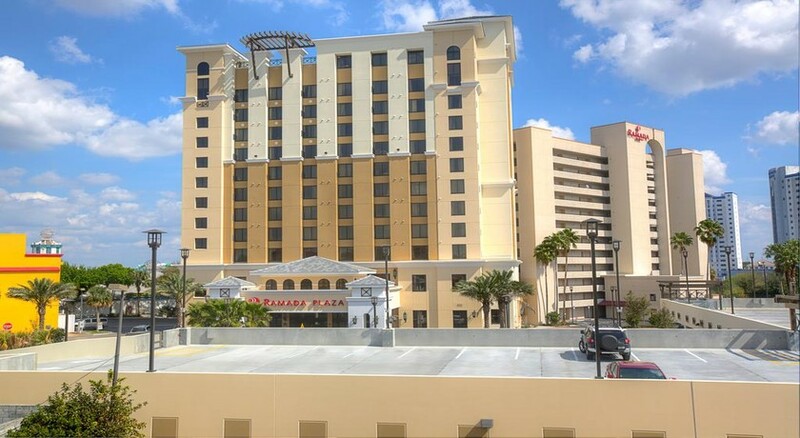 Conveniently located at the central hub of the tourist district of Orlando, Ramada Plaza Resort & Suites by Wyndham Orlando Intl Drive is a stone’s throw away from the Universal Studios and a host of other theme parks of that area, which makes it a great choice for family travellers. The clean and comforting rooms of the hotel come with all the modern amenities and facilities necessary for a pleasurable stay at the hotel. Guests can enjoy a lavish spread in the morning to start their day, followed by a hectic day of shopping or a day out at Universal Studios. Relax by the outside pool or by the rooftop pool and enjoy free Wi-Fi facilities provided by the hotel. 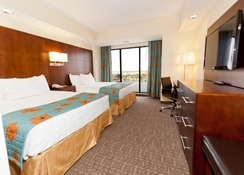 Whether you enjoy a fun-filled day at one of Orlando’s famous theme parks or explore the resort’s landmark International Drive, the Ramada Plaza Resort & Suites by Wyndham Orlando Intl Drive is the ideal location to spend your dream Orlando vacation. The hotel has the perfect location for enjoying a fun-filled trip with your family. 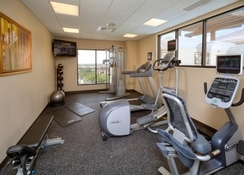 The hotel makes it possible for the entire family to enjoy everything that Orlando has to offer. Explore the famed theme parks of Orlando, most of which are located near the hotel. These include Universal Studios (just a short walk from the hotel), Harry Potter and the Forbidden Journey (5.4 km away) and Walt Disney’s World Resort (14 km). The rooms and suites in the hotel are well furnished with elegant furniture, plush upholstery and linen and modern amenities. The hotel has two towers: the North Tower that houses the suites, and the South Tower that is home to standard rooms. 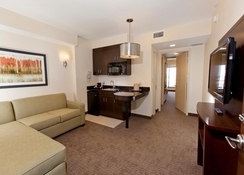 Each suite accommodates up to 5 guests, while each room can accommodate 4 guests in total. The rooms come with beautiful views of the Lakeside or International Drive. They also come with high-speed internet, microwaves, coffee makers, flat-screen TVs and so on. Breakfast is on the house. The parking is free and there is no resort fee for the guests of the hotel. There are two distinct types of breakfast offered in Ramada Plaza Resort & Suites by Wyndham Orlando Intl Drive. One for the room guests and the other one for the guests of the suite. Common items include tea, coffee, milk, bagels, wheat toasts, white toasts, donuts, oatmeal, condiments, fresh fruit and so on. Suite guests are offered complimentary champagne as well. Apart from lounging near the pool and enjoying the pleasant views of the lakeside, guests can do a plenty of other things as well. Spend time in the games room, or relax on the sundeck. Enjoy a VIP tour of one of the seven theme parks of Orlando, a Miami day tour from Orlando, a trip to Kennedy Space Centre or even a helicopter ride from the Walt Disney Resort area.